Jen is very good. She had the opportunity to have a delicious meal tonight for free. Even though she had to go to the dinner she opted to only have a tiny salad so that we could have dinner together. Isn't it enough to just make you sick? I had to rush home from work (no free dinner for me) because today was our bi-weekly farm pickup. 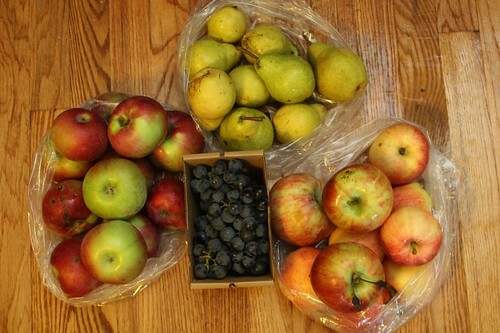 This delivery saw MacIntosh Apples, Clapp Pears, Gala Apples, Cortland Apples, and Concord Grapes. For a first course tonight, instead of salad, I went with the red onion pasta I'd purchased at yesterday's farmer's market from Flour City Pasta. 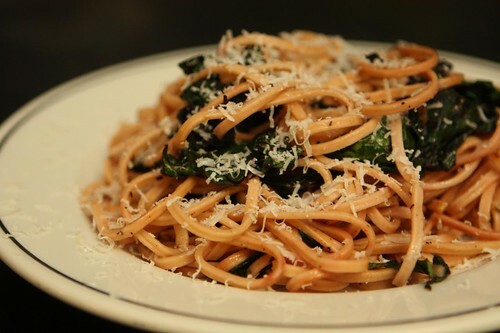 I wanted to enjoy it as is so I just boiled it, tossed it in a little butter, garlic, and olive oil, then added the beet greens from last night with a little salt, pepper, and Parmigano-Reggiano. For the main course I picked up some grass fed New Zealand lamb tenderloins, mostly because I'd never seen them sold individually like this before, and seared them in a pan. I wanted to grill them but the outside was too dark and mosquito-filled so I let laziness and fear make that decision for me. That's the best way to live one's life. 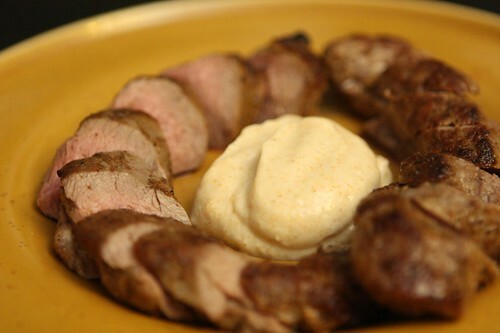 I served them with a Sambar yogurt sauce using Sambar powder, a touch of cider vinegar, salt, and yogurt. 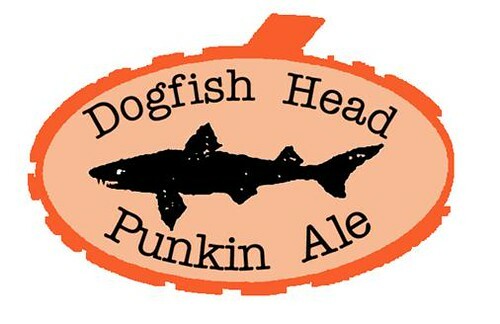 Last year I wanted to try the Punkin Ale from Dogfish Head. Unforutnately it happened to sell out almost immediately everywhere that carried it, partly in due to the popularity of the show Brew Masters. Jen and I recently got very interested in this show, only to be saddened after we learned there were only a total of 5 episodes. This is one of the greatest shows about beer ever made, mostly due to the strange bro-charm of Sam Calagione, Dogfish Head's founder and CEO. Try as you might, you can't dislike this man. He is like a more intelligent version of Ted "Theodore" Logan with a strong passion for flying across the world to buy exotic ingredients to throw in his beer. This year I was delicighted to find it so I picked up two bottles for us. Jen usually sticks to the beers she knows but she's often willing to partake in something adventurous. This is also due to the charm of Sam "Theodore" Calagione. I was fully prepared to enjoy the bottle until I stumbled upona beer store selling it on tap this afternoon. The keg had just been tapped and I was allowed to purchase the first bottle. How could I turn this down? This was actually one of the only pumpkin beers I've tasted that actually tasted like pumpkin and not just of some mild pumpkin pie spice. Like most Dogfish Head beers it was of extremely high quality and very interesting. 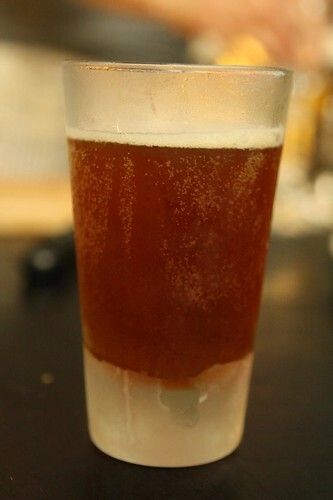 I guess you could say that it was an off-centered ale for an off-centered person.